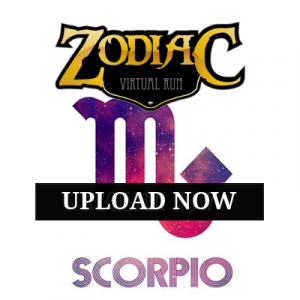 MM ZODIAC VIRTUAL RUN - SCORPIO | Connect by JustRunLah! Dates: – Registrations will close on 30 November 2018 or when all slots are sold-out. – Run(s) must be completed between 1st November and 31st December 2018. – Medals will be mailed from 15 November 2018 onwards. Remarks: Run(s) must be uploaded by 15 January 2019. You can combine multiple run uploads within the challenge period to qualify for the medal. Make sure the address is correct. Instructions how to upload your run and receive your medals will be sent there. * Additional shipping fee of RM20.00 applies for Singapore, Indonesia and Philippines. Please upload a screenshot of your running app showing the map, date and distance of your run.